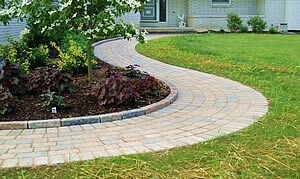 Paverscape Inc. will create a walkway to fit any location. Our curves are flowing and each cut is fit to precision. Our attention to detail goes into every Piece and each design is a unique fit for your home. We also offer an optional heating package so you can keep you snow shovels in the Garage! Techo-Bloc Allegro Sandalwood Paver Walkway and patio project. Techo-Bloc BLU Paver walkway in harvest gold and chocolate with Parisian Border. Techo-Bloc Allegro Sandalwood Paver walkway Rocka steps, Victorian Border. Techo-Bloc BLU Paver walkway in Champlain Gray with Victorian border. Techo-Bloc Allegro pavers with random running bond pattern.